This topic contains 6 replies, has 2 voices, and was last updated by Paul 8 months, 2 weeks ago. Big images are actually scaled down automatically, you just need to use another grid setting to achieve what you are looking for (‘Masonry’). If you want to precisely control the image that is being displayed on the blog page, and cut some images to squares, some to landscape and some to portrait, you can do it with this plugin. The thumbnail used on the blog page is called ‘mauer_thumb_3_softcropped’. After you do that you might need to clear your browser cache to see the changes. As for the ACF Pro plugin, you can not update the ACF Pro plugin on your own because its license does not allow that — if you got a copy of the plugin, as part of a theme. You’d need to directly buy a license for ACF PRO to be able to update it, however the changes in the latest version of the ACF PRO are really minor and don’t affect the performance of the theme in any way. So I would not say it’s worth the hassle. I have sent you a copy of the ACF Pro plugin (latest version) to the email with which you are registered on this forum. But I don’t understand. I download Post Thumbnail Editor and switch the theme with Masonry but I still have the same problem. – Even if I don’t want to control all the size, I still don’t have square images. – The portrait/paysage image don’t have the same size. 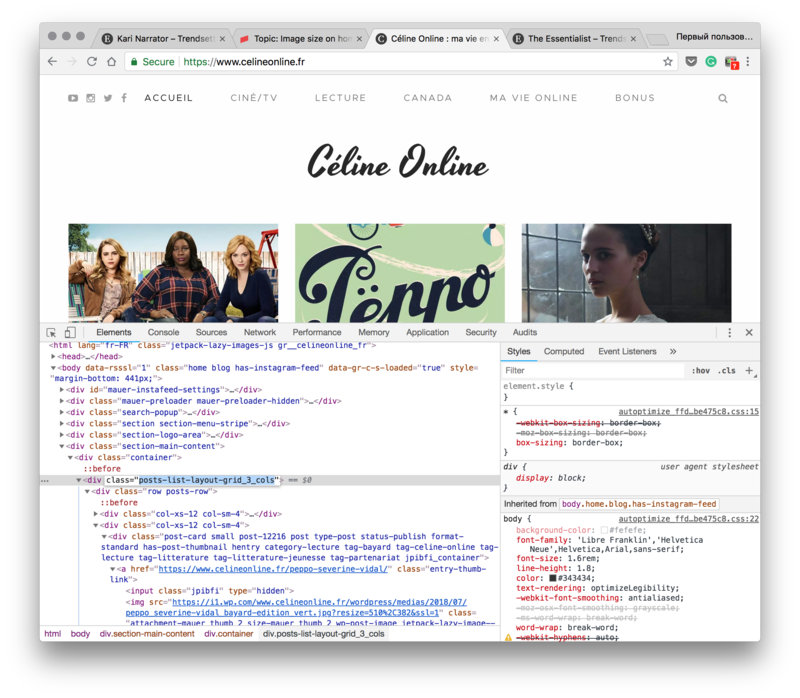 – On article page, some header have size problems (exemple : https://www.celineonline.fr/love-simon-de-greg-berlanti/) Why is not automatically resize on some article ? This reply was modified 8 months, 3 weeks ago by celineonline. Judging by the code of the website, it is still using the 3-column grid layout. See this proofing screenshot (the respective line is highlighted in the code). Please switch to ‘Masonry’ to have the masonry layout. Also, judging by the pictures URLs, you are still using the “Serve images from our servers” option. Please turn it off as described above. If you are using some caching solutions, they may prevent the changes from being visible until you purge the cache. Yes of course that it is still on 3-column grid layout. I can’t leave my website with a “broken” homepage, with no regularity in the image sizes. I have tried again Masonry + turn off “Serve images…” + Post Thumbnail Editor and it still not working. It’s too bad for me. I paid a theme for a specific style and I can’t use it… But I can’t buy an another one. So can you tell me the size of the image for the 3 column ? I am sorry to hear you are having a hard time figuring this out. If you prefer to switch to another theme, please submit a refund request through ThemeForest, and I’ll approve it (after that you will not be allowed to use the theme anymore). I am not sure I understand what you mean by “the size of the image for the 3 column”. As of now, I can see the images displayed correctly on celineonline.fr. They are displayed the way they were designed to be displayed in the 3 column grid layout. And if you want to have Masonry layout, please turn on Masonry in theme options and then upload images of different aspect ratios (a square, a portrait, a landscape, etc.) and they will be displayed on your front page having different aspect ratios, just as here: demonstration. In this screenshot you can see I’ve uploaded a vertical image, and now I’m creating a square version of it for the masonry layout right in the admin panel. Let me try to explain it with this example: the theme will not make a square out of a portrait image. 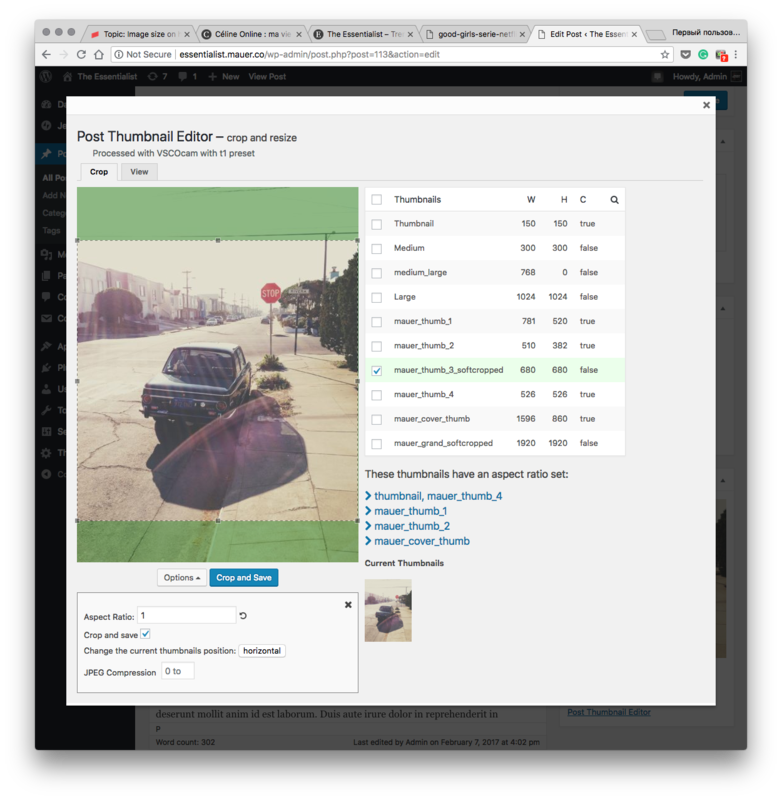 You need to either upload a square image, or upload a non-square image and make a square out of its ‘mauer_thumb_3_softcropped’ thumb using the mentioned plugin (as shown in the screenshot). As for documentation saying “Upload big images, they will be scaled down automatically”. This is actually happening. For instance, you have uploaded this big image. It is 2000×1333 pixels. And the theme is showing the following scaled down version of it on the front page to save the traffic – scaled down image. Its size is 510×382 pixels. You did not upload the 510×382 image, you only uploaded the 2000×1333. The 510×382 was created automatically. So that’s how automatic scaling down works.